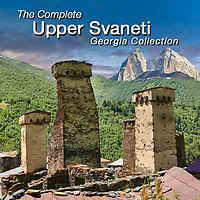 Pictures & images of the historic Svaneti tower houses and Svaneti villages of the Upper Svaneti in the Caucasus Mountains, Georgia (country), Europe. 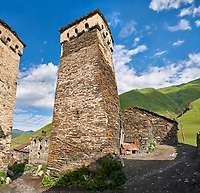 The Svaneti villages of the Upper Svaneti region of Georgia are some of the most remote settlements in the eastern European Eurasia region. 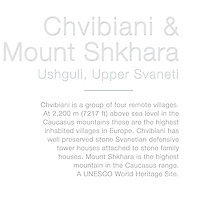 The highest settlements are four villages grouped together and known collectively as Ushguli. 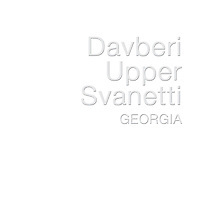 This is the highest inhabited settlement in Europe at 2,200 m (7217 ft) above sea level situated at the foot of the highest mountain in the Georgian Caucasus Mountain range, Mount Shkhara, at 5,068 m (16,627 ft) above sea level. 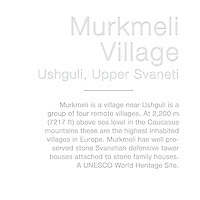 In the winter Ushguli is cut off from the outside world for 6 months from November to the end of April. 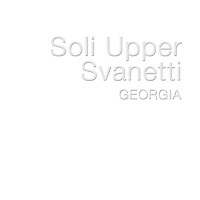 Even when the snows have gone the track that runs from Mestia, 30 miles away, can take 3 hours to drive. 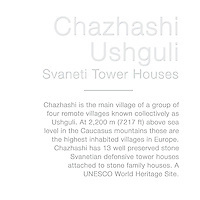 Isolated and vulnerable to attack the medieval inhabitants of the Upper Svaneti built stone defensive towers onto their single storey houses, the oldest dates back to the 9th century AD Ushguli name comes from Georgian phrase ushishariguli which means “fearless heart” and is one of few places in Georgian that has never been conquered. 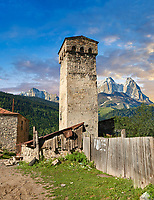 Indeed until recently the area was so isolated with bandits operating there that it was effectively closed to tourism. 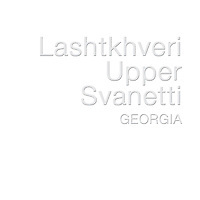 Today is a different matter with daily convoys of 4x4 vehicles ferrying day trippers from Mestia to experience the incredible and unique Upper Svaneti villages set agains the spectacular snow capped peaks of the Caucasus Mountains. 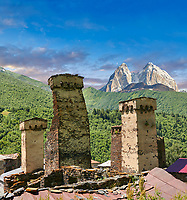 There are few truly unique travel destinations in the world and the Upper Svaneti is one of these. The Svan people are fiercely independent and protective of their long culture and distinctive language that has developed over 1000 years of isolation from the rest of Europe. 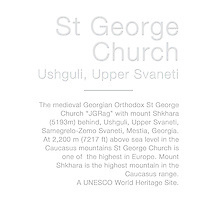 The Svan are deeply religious people with 5 Georgian Orthodox churches in Ushguli alone. 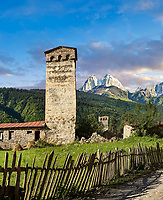 Download Pictures & images of the historic Svaneti tower houses and Svaneti villages of the Upper Svaneti in the Caucasus Mountains or bu as photo art prints on line.